Providence, Rhode Island quartet Deer Tick look minuscule spread across the expansive Palais Theatre stage but their sound is booming garage-rock and alt-country heaven on a drum stick. Merging the best parts of Dr. Dog and The Replacements with a twist of a Kurt Cobain-meets-John Prine snarl in vocalist/guitarist John J. McCauley’s howl, the lads are on point this eve. Attempting to fill just a 45-minute warm-up set with quality tracks from over seven records is trickier than milking a camel but they’re up to the task. We’re hit with an even spread of tunes from DT’s most recent pair of releases Vol 1 and Vol 2 (their sixth and seventh albums respectively, released in 2017), Black Dirt Sessions and more. ‘Twenty Miles’ the star of the show from this cut. Opening with The Replacements-esque ‘Don’t Hurt’ and ‘Jumpstarting’, McCauley leads a chorus of melody and crunch as the Ian O’Neil lead guitar releases high frequency bio sonar signals left, right, and centre. Herculean drummer Dennis Ryan takes on the hero vocal on ‘Clownin’ Around’ then smothers himself and his perspiration in a jumbo-sized white fluffy towel. O’Neil then serenading us with the indie-country shanty ‘Hope is Big’ before McCauley pulls out a surprise cover of Billy Preston’s ‘You Are So Beautiful’ towards the death of an epic set that concludes with your reviewer kicking over a full glass of red and watching it bleed out down the aisle. 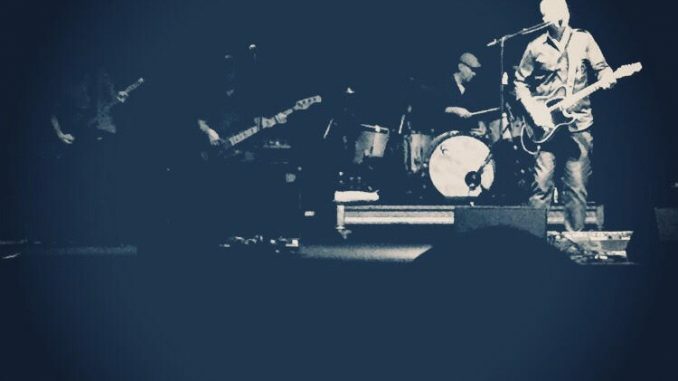 Jason Isbell & The 400 Unit are pure class as always with Isbell’s slide-work on the Drive-By Truckers-penned 2003 belter ‘Decoration Day’ duelling with lead guitarist Sadler Vaden’s supercharged blues-rock riffs. Pressing through tracks from 2015’s Something More Than Free (‘If It Takes a Lifetime’, ‘24 Frames’, ‘Flagship’) and 2013’s Southeastern with the remorseful, ‘line in the sand’ quitting the booze anthem ‘Cover Me Up’ attracting a round of proud applause. There’s the obligatory touring-international-musician-travels-to-Australia story with Isbell making mention to the flight distance. “I thought I lived on that plane. Are we lost?” he quips. ‘Stockholm’ and ‘Travelling Alone’ are typically masterful. Ditto ‘Elephant’ and the muscular ‘Flying Over Water’ with Isbell and Vaden again trading guitar blows. Pound for pound. Glorious. Last year’s The Nashville Sound gets a good run with arguably some of Isbell’s finest ditties to date appearing: ‘Chaos and Clothes’ is a surprising take on the love triangle between Mandy Moore and contemporaries Ryan Adams (close friend who was part of the intervention to get Isbell treatment for alcoholism back in 2012) and Dawes’ Taylor Goldsmith. “You’re in a fight to the death my friend/Black metal t-shirts your shield… Now name all the monsters you’ve killed/Last night I saw a burning Ferris Wheel/You say love is hell,” sings Isbell, as he references Adams’ 2004 album, Love is Hell and song ‘I See Monsters’. 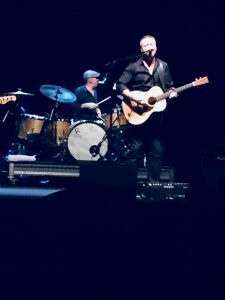 ‘White Man’s World’ and ‘Tupelo’ (The Nashville Sound) are seriously A-Grade as is ‘Codeine’ from 2011’s Here We Rest, not to mention Isbell’s banter and appreciation of the Australian mullets he’s seen while on tour. “You guys with the mullets… you should all get Travis Tritt down here,” he jests. Six years sober. Multiple Grammy winner. Father. Husband. Fast becoming a musical legend.